Ever wanted a summer/beach/bikini body? Moisturizer aside this product is all you need. So far I've been pretty disappointed with all the body scrubs I've tested, eventually I opted for a body brush and have been quite pleased with the performance. 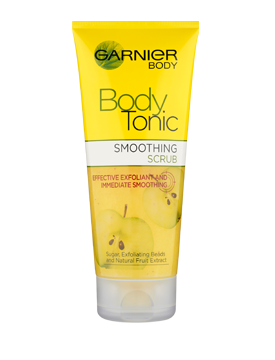 Garnier Body Tonic Smoothing Scrub however takes the body exfoliating game to a whole new level. I'm not entirely sure about the toning, I haven't noticed any difference, isn't it what gym is for? It is a brilliant scrub though as the smoothing is instant and thorough. I believe it offers the best results when used on a slightly damp skin. It's usually sold out so grab it when you see it. I've known about Emma Hardie Moringa Amazing Face Cleansing Balm for years, I've read countless reviews and have wanted it of course but couldn't justify the price tag for a long time. I bought it eventually and been using it for a month now mainly in my PM routine and yeah it's been a pleasure. Now the issue is: do I repurchase or is there a decent dupe out there? Please let me know. I have also been trying out the Kiehl's Midnight Recovery Concentrate and can definitely tell it's working. It promises restorative results and with my skin looking more even, softer and smoother after only a couple of days of using it I'm pretty pleased with the purchase. What else would you recommend from Kiehl's? What have you been using and loving recently? Anything you could recommend?